I knew from the start that Dominick & Shola's wedding was going to be jam packed with special details. I knew from the start that they were going to be amazing clients. All that being said, however, I still found myself astounded at the extent of these facts as I photographed this wedding. 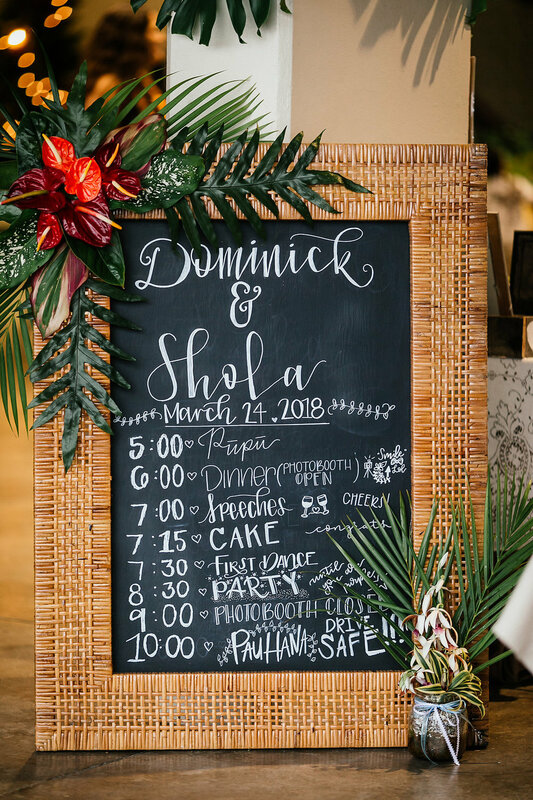 Although Dominick & Shola both live in Hilo, Dominick grew up in Kona, and they decided to hold their wedding ceremony and reception there specifically because Kona's weather on the West side of the island is usually more reliable than our beloved Hilo's is. (Note the key word: usually) On the particular weekend of their wedding, the ENTIRE ISLAND of Hawai'i was under a flash flood watch. The weather forecast predicted straight line winds of 60 mph or more, blizzard conditions on our two mountain summits, thunderstorms and "tornadoes were not out of the question". (As the Hawai'i County Civil Defense stated) VERY unusual weather for Kona, and the whole island for that matter. The county actually closed ALL county parks on the island in lieu of high surf. I was a bit worried. Maybe that's an understatement. Nevertheless, Dom & Shola got the OK from the county to go through with their wedding reception at a county beach park facility, their ceremony was moved indoors, and the day was INCREDIBLE. I can't even begin to express in words how amazingly meaningful the details of their wedding day were, so I asked them to help me a bit. Before the wedding, Dom & Shola decided to make their own paper for the back of their invitations. They made the paper. She joked that the cost of the postage to send them was more expensive than the invitations themselves. Shola's lei po'o (also known as a haku lei) was made for her by her elementary Kumu (teacher). She explained that his health isn't very good, so it is more difficult for him to make lei po'o now days. She also added that he usually only makes lei po'o for his hula halau for performance purposes. 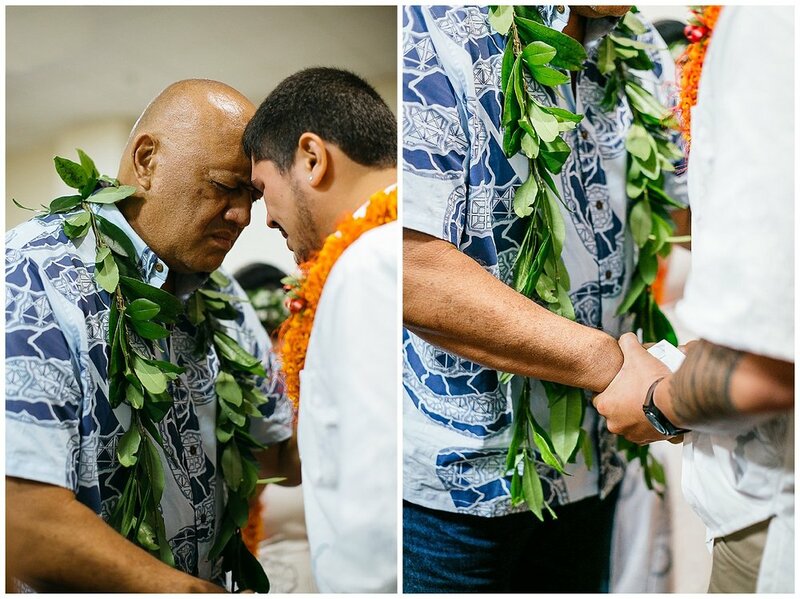 However, when Shola asked him to make her a lei po'o to wear at her wedding, he was ecstatic. 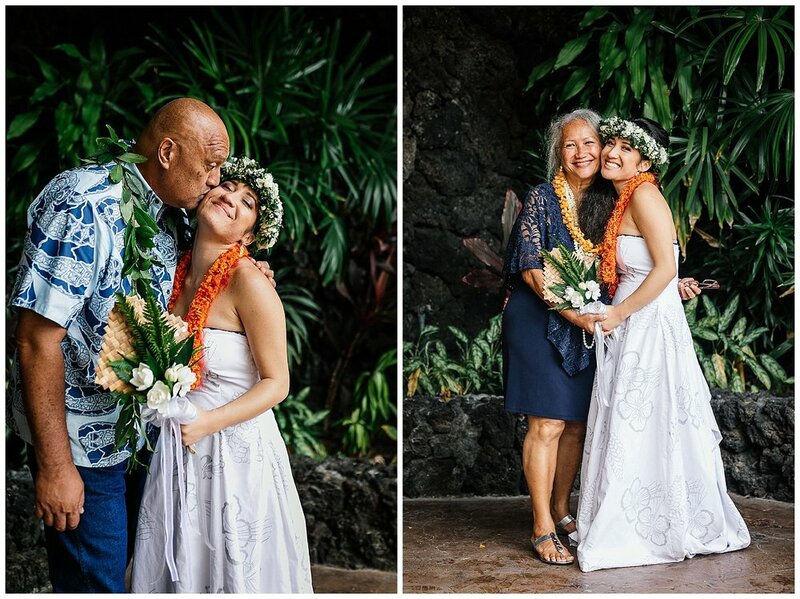 He spent two days looking for just the right foliage, and put his all into creating the lei for her. 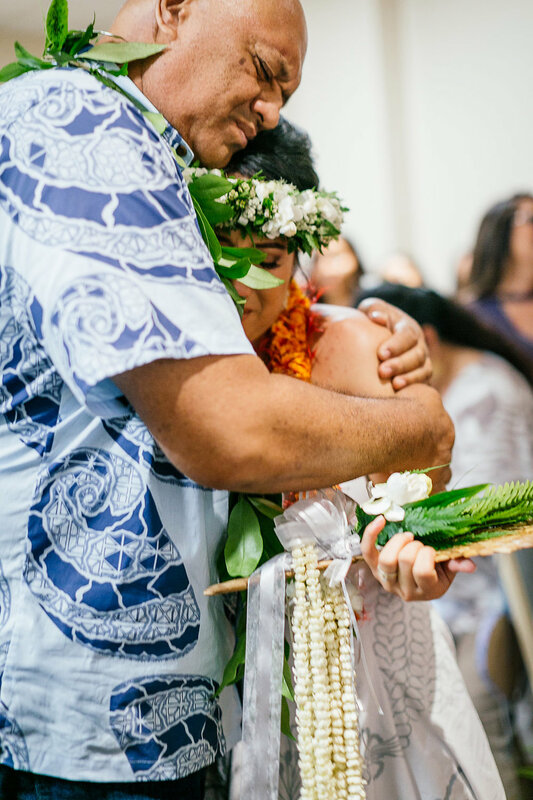 Shola cried when she saw it on her wedding day, stating that it will also be the last lei po'o her kumu ever makes Um WHAT?! How insanely special is that? During the ceremony, Dom & Shola did a "mixing of the sands": the couple takes two individual viles of sand and pours them into one container, signifying the two becoming one in marriage. They didn't just use any old sand, however; they both took the time to gather sand from each of their favorite beaches. Shola's sand came from Honoli'i beach park on the Hamakua coast. 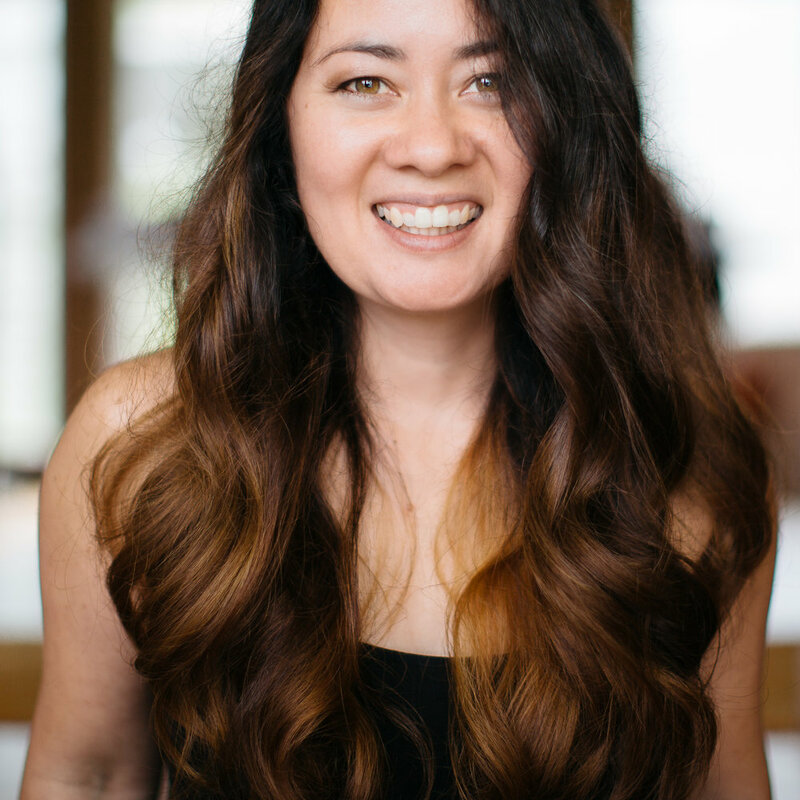 Shola shared that Honoli'i is her favorite place in the world. She loves to go there first thing in the morning to watch the sunrise from her surfboard on the waves. Due to the waves, Honoli'i doesn't usually have sand, except for a small sandbar that is easily washed away during most times of the year. Being able to get sand from Honoli'i was so special for Shola. Dominick's sand came from Pine Trees beach in Kona. They shared that Dominick was born in Kona, and Pine Trees was also the beach where Dom proposed! Now, get this: the entire wedding party's attire was custom designed and made... by Shola's Aunt. 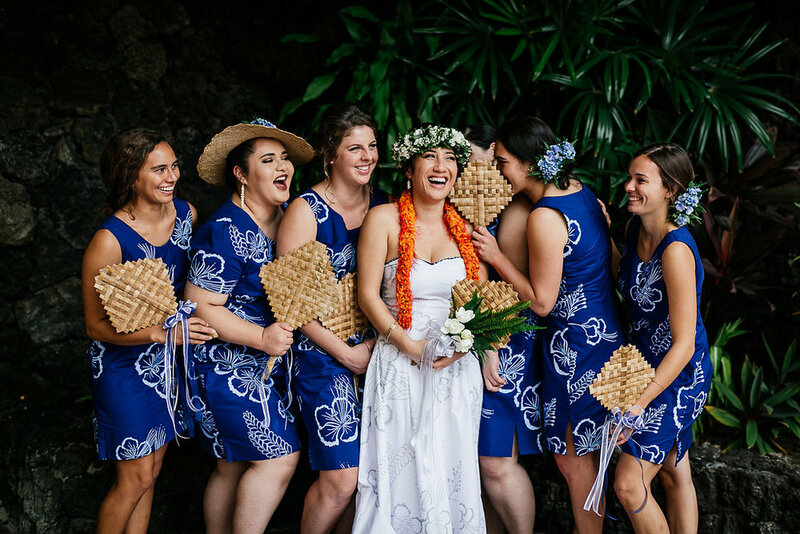 Shola shared that her Aunt owned a silk screening business on the small island of Moloka'i, and was so glad when Shola asked her to design a print for their wedding attire! The print is a representation of Dom & Shola's wedding song as well as them as individuals becoming one. The flower depicted is the Ohai Ali'i, and their wedding song was "Ohai Ali'i Kaluhea" by Kuana Torres Kaele. If you look closely, you will see that the stamens of the flowers are intertwined, representing the two individuals coming together as one through marriage. After the designing process, Shola, her mother, and her Aunt silk screened all of the fabric for the wedding party in the span of two weeks. After that, Dominic's Aunt sewed the shirts, and the dresses were sewn by a seamstress in Hilo. I could tell just by being there that Dominick & Shola are so very loved, by both family and friends. Both of their families came together and were so generous with their time and talents. All of the food provided at the reception was made by family. (If you've been to a wedding or any type of party in Hawai'i, you know the food is always good) It was definitely a labor of love; seeing as the menu included kalua pig (this dish needs to be slow roasted in an imu, an in-ground oven), fresh poke, warabi (takes hours upon hours of prep and work), kalua nachos, etc.